So, I wasn't terribly impressed with Star Wars #1 or Darth Vader #1, and while I wasn't alone in my assessment of either issue, it seems most fans did, indeed, just want to spend more time with the most familiar versions of their favorite characters. If there was one title that most excited me, however, it was Mark Waid's Princess Leia. Waid is one of the most reliably excellent talents in the industry, Leia is one of Star Wars' most underserved characters; it seemed like a perfect match. But I didn't want just another "Leia tagging along with Luke and Han" story, and after those first two debuts, I was sure that's what we were going to get - a drama-free hangout book. Blessedly, surprisingly, Waid evades that trap with skill. 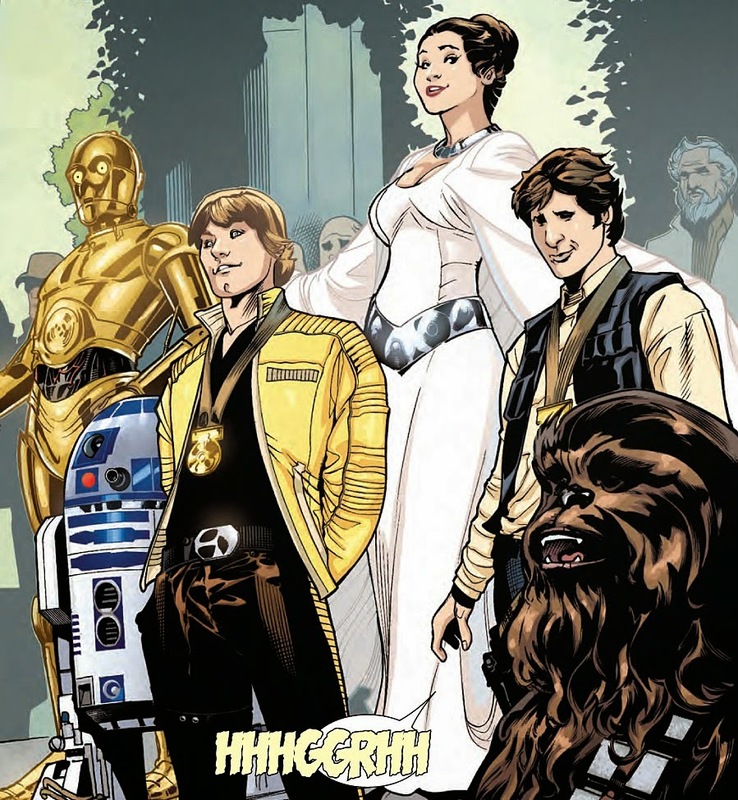 Picking up in the final seconds of Star Wars, Leia presides over the medal ceremonies of Luke and Han, but where the film stopped, the comic keeps going. Leia offers a small tribute to the people of Alderaan - and, because she's a woman and a politician, the book immediately delves into the man on the street, as three rebel pilots comment on how impersonal the tribute is. Leia soon meets one of those pilots, an Alderaanian named Evaan, and it is from that clarifying conversation that she develops her plan: She and Evaan will hunt down Alderaan's surviving children in an attempt to protect them from the Empire and offer them a chance to rebuild the community they recently lost. Writer Mark Waid managed the impossible: He found a compelling story to tell between films. Princess Leia #1 is character-driven, with a narrative hook that doesn't depend on the films and that we know nothing about. Waid sets up a clear goal, gives her a supporting cast member that doesn't feature in the movies, and sets up the opportunity for plenty of future adventures. We may know Leia's ultimate fate, but this mission is a great opportunity to explore something the movies never really touch upon: the personal and political ramifications of Alderaan's destruction. It's vital to Leia's character, a great hook for an adventure, and subtle enough that Waid has considerable flexibility in how he handles it. The Dodsons are reliably strong here. Where Cassaday and Larroca attempted a photo-referential look that made the action draggy and the characters look stiff and lifeless, Terry and Rachel Dodson stick with a cartoonish style that slightly abstracts its characters. Luke doesn't look like Mark Hamill, but they capture his blond mop of hair and earnest posture well enough that you never wonder who you're looking at; their Leia has an impish, restrained energy that recalls Carrie Fisher's playfulness in the role well. This issue is very action light, but it never feels as slow or stilted as the other Star Wars books, and the Dodsons play a huge part in why that is. So, yes: Princess Leia #1 is the strongest of the Marvel 'Star Wars' debuts by a considerable margin. It isn't a great debut - it's about as basic as can be - but it is the only one that, at least in its first issue, has figured out how to tell a story between movies. While I would still argue that this is a critically flawed conception from the get-go, Waid is an old pro who doesn't make the same mistakes made by Aaron and Gillen, and he gives Marvel its first truly interesting Star Wars comic. Whether he'll be able to build satisfactorily on these ideas is another question, but Princess Leia #1 is at least a promising start, and the only of the new Star Wars comics that I can recommend with little qualification. Princess Leia #1 was written by Mark Waid, illustrated by Terry Dodson, inked by Rachel Dodson, colored by Jordie Bellaire, and lettered by VC's Joe Caramagna. 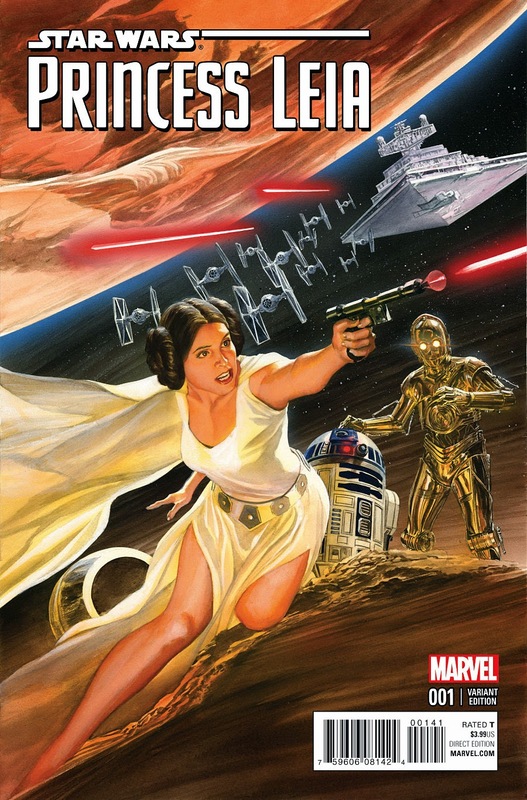 Published by Marvel Comics, Princess Leia #1 was released on March 4th with a cover price of $3.99.